NO! In fact, HELL NO! 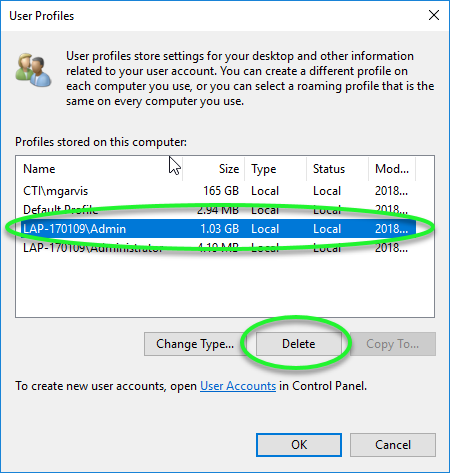 Okay, that led me to believe they had simply deleted the c:\Users\%username% directory, and we had to clean up that mess in the registry (under “KEY_LOCAL_MACHINE\SOFTWARE\Microsoft\Windows NT\CurrentVersion\ProfileList”, delete any entries that have the .BAK extension). 1) Open Control Panel > System and Security > System in the affected machine. The simplest way to do this in the more recent releases of Windows 10 is to click Run – sysdm.cpl. 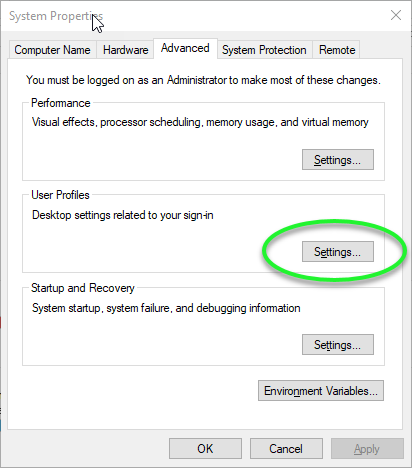 4) In the User Profiles window, click on the user you want to delete, and click Delete. **NOTE: You will not be able to delete the account you are logged in as, nor the default Administrator account. Of course, you will be asked if you are really really sure that you want to delete the account, and you can click Yes or No as you wish. There are ways to do it in PowerShell… but they don’t seem to be very clear or very easy. For this one time, I strongly suggest the GUI. ← Stored Passwords–Beware, and know.